Montana Peak crown measuring 5 3/4", brim to tip of "peak." Hat body is wool, olive drab in color. This hat is not presently available in a fur felt version. Four "split to set" eyelets set at 90 degree intervals in the crown for ventilation. Early shoe lace type chin strap. Brass tipped cotton laces correctly led down through concealed eyelets in the crown to pass between crown interior and sweat band. Genuine leather sweat band, 1.75" wide, creased and turned under per originals. Chin tie passes between sweatband and crown interior. 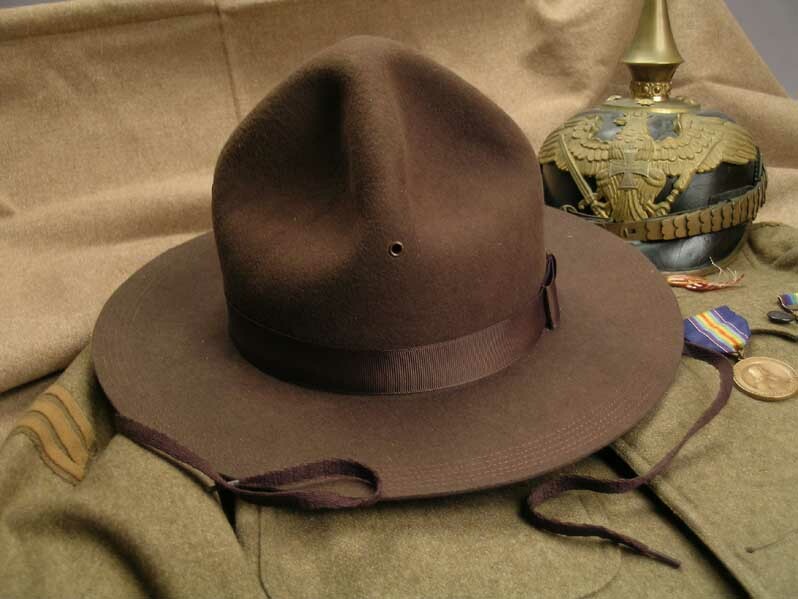 This is a detail found on the early 1911 pattern campaign hats. Hat ribbon bow and ventilation eyelet detail. Detail of the five row brim stitching.